So when we find a crater, we can be certain that these events also have occurred. One of the best documentation about impact craters can be found attached at an advanced impact calculator available online. When an impact occurs, a transient crater forms. The volume of this crater is for 1/3 caused by material thrown out, and 2/3 is due to compression. This compression rebounds, which causes the crater to change shape. It becomes flatter with a larger diameter. When the crater is larger, the crater continues to change shape due to gravity. It causes the center to bulge up, causing a “mountain” in the middle and the rest of the crater becomes flatter and larger. The various processes take time. For example, the earthquake is the fastest. There are four types of earthquakes, and their speed ranges from 2 km/s to 12 km/s. The air blast is much slower, as that travels with 300 m/s. This causes the processes to interfere. The faster processes can influence slower processes. This makes impact calculations much harder. The impact effects program does not include process interference. 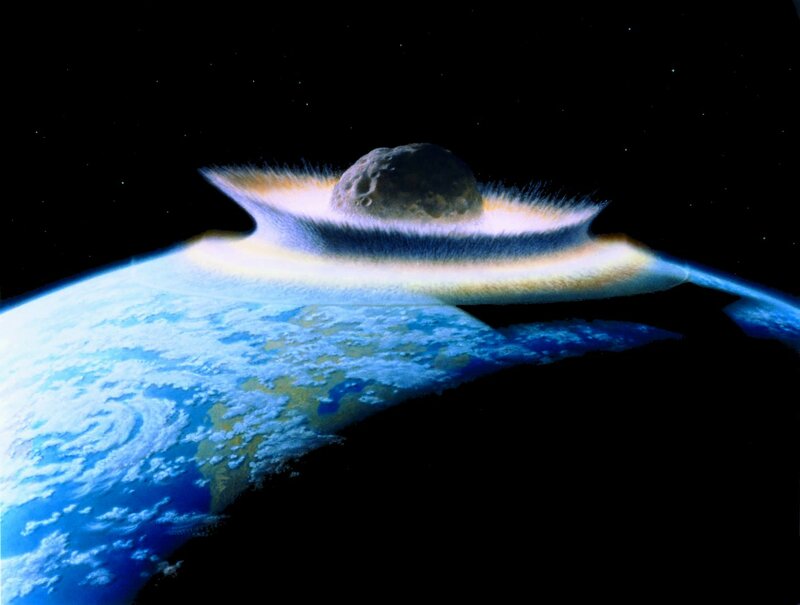 So for example, when it says there will be an air blast at the other side of the world in case of a very large impact, this may not be as strong as it says, because the crater formation may block the air blast itself. Due to this interference, even more complex events could occur. When melt occurs below the crossover depth of the earth, craters would not rebound as usual. We can be sure that deep decompression melt would be heavier than the surrounding rock. The crater would not explode, but implode. So in stead of all the energy exposing itself to the surface of the earth, the vast majority would simply be swallowed and the crater would collapse. What are the consequences for the shape of large craters? We would probably not find them as such. In stead we would find a volcanic area in which the deep part drains the heat towards the earths core. What this looks like should be investigated using powerful simulators. I expect that what we interpret as hotspots are in fact medium sized craters. I expect what we interpret as subduction areas are actually very large impact craters. If that is true, than forget classic subduction theory. In that case it happened fast, thus contradicting the deep time assumption. Calculation show the amount of energy coming from extremely large impact craters is in deed enough to boil away the ocean. But does this happen? This is not easy to answer. To boil the ocean, the water must be able to reach the crater. The water starts to heat to boiling temperature and vaporizes. But once that water vapor reaches colder places, such as continents, it starts to rain dramatically there. So yes, it would boil away the ocean locally, until the water is out of reach for that crater, but not globally. One can expect a massive flood in case of a very large impact in the ocean. Heat transport is not effective to distribute heat all across the surface of the earth. Heat transport can be done by three mechanism: conductivity, flow or radiation. Since the earth is a sphere, there will always be a part out of reach for radiation. The earth is not a good heat conductor, thus causing the heat to mostly stay where it is (at that crater) until it has been cooled down by thermal radiation. There will be some heat transport by flow, because the ocean and the atmosphere can transport it. However, the ocean boils and does not get much hotter than 100 degrees Celsius. As said in the previous paragraph, the vaporized ocean cools down and further away from the crater it stays relatively cool. The atmosphere will transport heat, but that will be greatly hindered by the water. The heat capacity of water is much more than that of air. So the ocean would change position, but it may protect the atmosphere from heating too much. In order to understand how heat would behave in case of a major impact event, we should take all these processes in consideration. The only way to get a clear idea of the heat contrast may be by using simulators. Those simulators must calculate all types of heat distribution and heat transport interference. Megatsunami’s are the result of a large impact in water. It is the same type of wave as when a rock is dropped in water, but then larger. This causes an oceanic ripple, and when that reaches land it is pushed upward. Anything that is on the coast would be wiped out as if a gigantic bulldozer is scraping it off. The scraped-off and pulverized land would later be deposited deeper onshore. One would expect this to result into a hodgepodge of a lot of materials, but known tsunami’s show that these aggressive waves are actually capable of sorting out materials. Besides, multiple “ocean ripples” from one impact result into multiple tsunami waves entering land. So one impact can result into a complete sequence of layers. The layering is pulsed. The water enters land, then it retreats, it enters and retreats and so on. This constantly adds new sediments, and immediately causes some erosion afterwards. There should be 36.000 craters on earth. There are 200 found on land. With only 30% of the earth being land, there should be at least 460 craters in the ocean. So we can expect at least 460 events of megatsunami-layerings. Since geology has not pointed out one megatsunami layer, we can be certain that geology is not giving correct answers. Deep time paradigm seems to be hindering geologic interpretations.